It was just a tiny speck, a single cell that researchers had marked with a fluorescent green dye. But it was the very first cell of what would grow to be a melanoma, the deadliest form of skin cancer. Never before had researchers captured a cancer so early. The cell was not a cancer yet. But its state was surprising: It was a cell that had reverted to an embryonic form, when it could have developed into any cell type. As it began to divide, cancer genes took over and the single primitive cell barreled forward into a massive tumor. Those were the findings of Dr. Leonard Zon of Boston Children’s Hospital, Dr. Charles K. Kaufman, and their colleagues, in a study published Thursday in the journal Science that offers new insight into how cancers may develop. The researchers stumbled on that first cell of a melanoma when they set out to solve a puzzle that has baffled cancer investigators: Why do many cells that have cancer genes never turn cancerous? 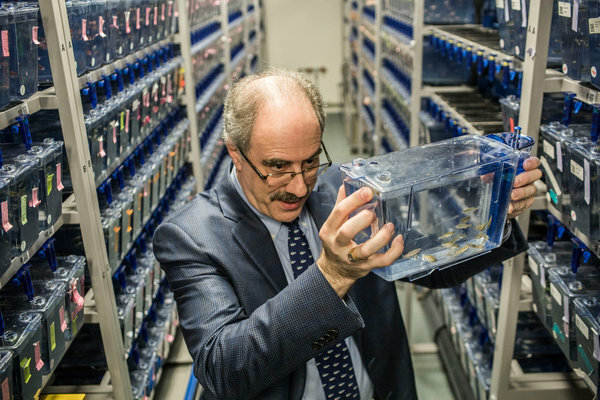 The work was in fish that had been given human genes, but the investigators found the same genetic programs in human melanomas, indicating that they too started when a cell reverted to an embryonic state. Much more study is needed, but researchers say the result can help them understand why melanomas and possibly other cancers form, and potentially prevent them. And it may provide a way to stop melanomas from growing back after they have been cut down by new targeted drugs. “It’s a significant advance in the field,” said Ze’ev Ronai, the scientific director of La Jolla Sanford Burnham Prebys Medical Discovery Institute, a nonprofit research center. Dr. Ronai was not involved in the study. The prevailing idea about the development of a cancer is that genes randomly mutate in a healthy cell, perhaps from sun exposure, perhaps from simple bad luck. The mutated genes drive aberrant cell growth, and the growing mass of cells accumulates more and more mutations that drive it to grow faster and spread until, finally, a cancer is formed. Yet researchers keep finding cancer genes in perfectly normal, healthy cells that never turn malignant. These are genes that take the brakes off cell growth and are considered essential drivers of tumor growth. Human skin cells are exemplars of the effect. In one study, Peter Campbell and his colleagues at Cambridge University looked for 74 cancer genes in normal skin cells. In many they saw the same pattern of mutations as is found in skin cancers. But since these cells were not cancerous, they realized something must be missing. What, besides powerful cancer genes, is needed to make a cancer? Moles also show the effect. “One of the things we’ve known about moles is that the vast majority never will become melanomas,” said Dr. Keith T. Flaherty, a melanoma expert at Massachusetts General Hospital who was not associated with the new study. “The odds are against it.” Yet almost every mole contains one of two potent gene mutations that are characteristic of melanomas, BRAF or NRAS, he added, and a third also harbor another notorious cancer gene, P53. New targeted drugs that block BRAF can slow melanoma growth. That was where Dr. Zon and his colleagues began 10 years ago. They were investigating melanoma by creating it in zebra fish, tiny transparent creatures that allow researchers to see cells and organs without cutting the fish open. The researchers put human BRAF and P53 genes in every melanocyte, the pigmented skin cells, of the fish. If genes were all that was needed for cancer, the fish would explode with melanoma. But the researchers found only one to three melanomas per fish. “That told us there has to be an additional event,” Dr. Zon said. By luck, they found it. The pigmented skin cells that became cancerous had turned on a gene, crestin, that is normally activated only in cells that are part of the neural crest, a group of cells pinched off early in embryonic life from a region adjacent to the brain. These primitive cells, depending on where they are in the embryo, can turn into pigmented skin cells or a variety of other types of cells, like those that make up bones and teeth, the covering of the brain or those that sheath and insulate nerve cells. Once cells develop into their mature tissue type — pigmented skin cell, bone or tooth, for example — the crestin gene shuts down. Those pigmented skin cells in the fish that had an active crestin gene had reverted to that primitive state when they were malleable, their fates still wide open. The investigators marked cells with an active crestin gene with a fluorescent dye, enabling them to spot the cells because they glowed bright green. Then they observed what happened. Every time a cell lit up green it divided and turned into a cancer. Cells that did not light up never turned into a cancer. That makes sense, Dr. Polyak said, because such primitive cells are more proliferative and more able to spread throughout the body. That is their role during development. They also can develop their own blood supply, something tumors do, too. 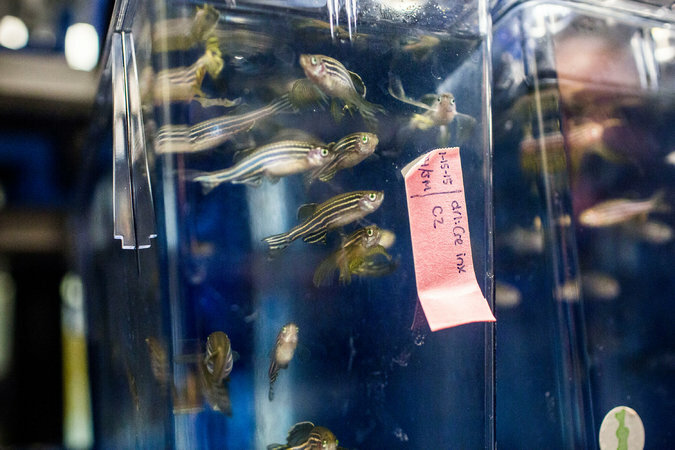 The zebra fish work was convincing, Dr. Ronai said. “They provide a pretty strong demonstration that that pathway is correct,” he said. “It’s a significant advance in the field.” It can, he said, allow researchers to monitor the early development of melanomas. But it also gives rise to a host of questions and hypotheses. These include why melanomas with BRAF mutations eventually become resistant to drugs that block the BRAF cancer gene. Could it be, Dr. Flaherty suggests, that the drugs prune off only the melanoma cells that grew from the original embryo-like seed cell? Might the drugs be sparing the embryo-like seed cell, freeing it to form another cancer? If so, those seed cells could be a new drug target. The hope is that if they are destroyed, the tumor will be gone for good. This entry was posted in Uncategorized and tagged Cancer, GL-W, Greg Lance-Watkins, Greg_L-W, Leonard Zon Dr, New York Times, NY Times, Single Cell, Skin Cancer, Zebra Fish. Bookmark the permalink.